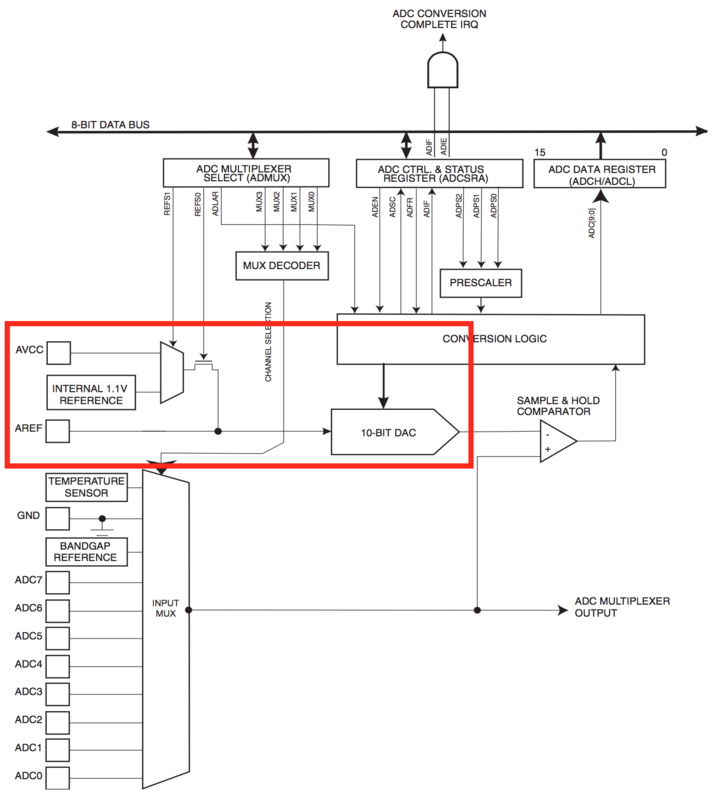 Does the conversion of the ADC count to voltage depend on the actual voltage of the +5 V pin? If yes, what is the accepted method of getting that voltage from the board? I have a circuit in which I have an Arduino Nano (clone) running from a USB connector (from a hub). The job of the Arduino is to measure the voltage on a battery which will drive a second circuit switched on/off by the Nano. For reference it is a battery tester. There is a Nokia 5110 screen which displays the voltage from the very simple sketch below. I measured the voltage of the battery using a DVM and it is 4.13 V, yet the Nano reports 4.35 V.
I have a common ground between the battery and Arduino. and the voltage reading on the Arduino was now correct. I did this not because I understand what I did, I did it because I had a hunch it might change the value to the correct one. The ADC inside the Arduino does not measure voltage, but rather a voltage ratio. Namely the ratio from the voltage at the analog input to the voltage at the Vref pin. This reference is about 1.1 V, and is is quite immune to fluctuations on the +5 V. The problem is that you cannot measure voltages higher than the reference. 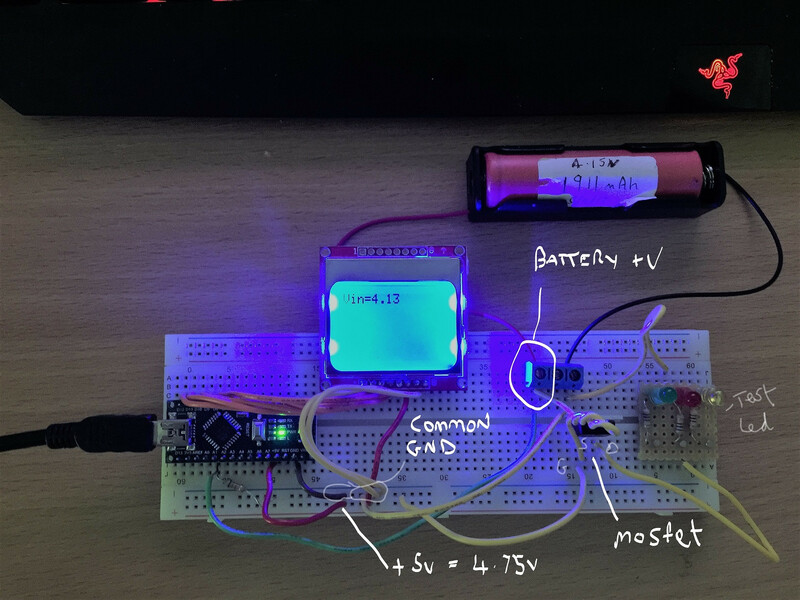 For your battery tester, if you want some sort of “absolute” measurement, you could use the internal reference and a voltage divider to ensure the measured voltage is below 1.1 V.
// Return the supply voltage in volts. Beware that the very first reading after boot may be bogus. A USB-powered Arduino Nano will have an ADC voltage reference which can't be relied on, due to the +/- 5% tolerance of the incoming USB voltage. On top of that, the Nano has an MBR0520 Schottky diode (D1) that will drop between 0.1 and 0.5 V depending on its own manufacturing tolerances, its temperature, and the current draw of your board. EXTERNAL: the voltage applied to the AREF pin (0 to 5 V only) is used as the reference. So the straightforward solution is building a weak voltage divider to get the voltage you want to measure below the INTERNAL 1.1 V reference, and then configure analogReference accordingly. The voltage divider needs to be weak (high R values) so you don't draw too much current out of the battery, but not too weak as to be loaded by the ADC input impedance. 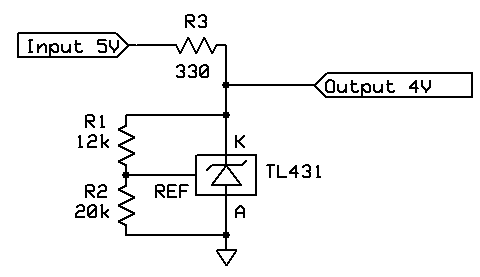 So a universal solution would be to build an external voltage reference based on a cheap TL431. That could give you a reliable reference up to 4.0 - 4.25 V with a +/-1% accuracy. By changing the resistors you can get other voltages (it looks like you want around 4.2V). The output voltage is not influenced by the input voltage (5V in this case). The linked page describes how you might choose resistor values. 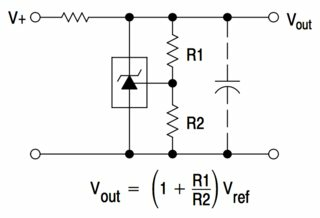 Does the conversion of adc count to voltage depend on the actual voltage of the +5v pin? yes and no: the adc module cares about Vref, which can be supply via Vdd, internally, or externally. If yes what is the accepted method of getting that voltage from the board? by configuring the adc module. the device datasheet should have registers / bits that need to be set up for that. Not the answer you're looking for? Browse other questions tagged arduino-nano analogread voltage-level adc analogreference or ask your own question.